The colour is yellow gold and the texture shows no legs and very late fat tears. The nose is rich and complex on a honey-sweet and fruity profile (ripe bananas, peaches, apples and more). The taste is nicely layered on sweet (barley sugars, honey), fruity and wooden flavours - all in a perfect balance. Some water opens the dram even further but be cautious not to add too much as it flattens both the nose and taste. The initial mouthfeel is warming and instantly coating with a slightly drying feeling (from tannins, no wonder after 40 years in the cask) that is not unpleasant at all. The finish is long and repeats all the flavours from the palate with a minor bitter note from the woods. What a ride. If the finish was better it could be around 94 points, but it just kind of falls apart right at the end with the hemp notes. Still a great malt, would love to have another go. This really developed a lot of those delicate and special notes which make whiskies of such an age worth seeking out. Rich wood. Celery salt. Caramel rounds. Dusty bookshelves. Herbal honey. Soy sauce. Bitter orange. Very big fruit note. Oak. Chalky. Woodspice. Green pepper. Salty toffee. Long. Spicy, mainly peppers. Old pepper. Menthol. There really isn't anything to dislike about this whisky - a herbal fruit bomb from the 70s, not too sweet, not too dry, with a good oomph and definitely nowhere near being overpowered by oak (thank god!). 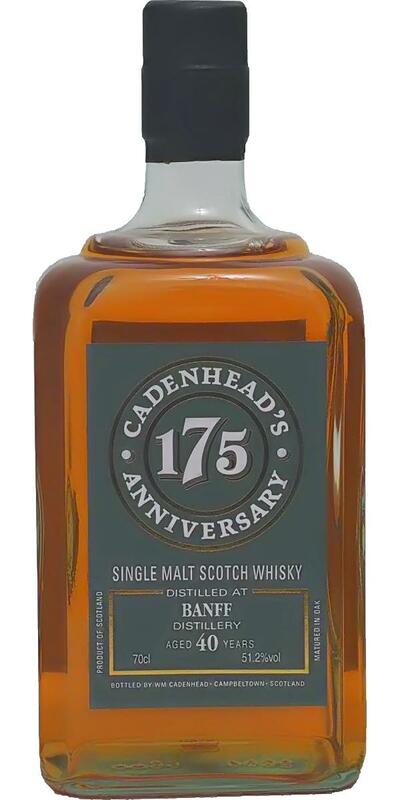 A very nice dram indeed, worthy of the 175th anniversary it was being bottled for.